NEW Webinar - Want to hear the latest on Heart Health: The role plant sterols play in maintaining healthy cholesterol levels with Dr Tim Crowe and Professor Peter Clifton? Heart health is a serious issue for thousands of New Zealanders . Approximately 1 in 4 New Zealand adults have elevated cholesterol  . A number of large, long-term studies clearly show the important role that elevated cholesterol plays in heart health [4-7]. Lowering cholesterol is recognised by leading health authorities as an important contributor to heart health . Adopting a diet every day that emphasises a variety of wholegrain cereals and breads, vegetables, fruits, legumes, including soy, nuts and seeds, soluble fibre and healthy fats are important to help manage your heart health. Other healthy lifestyle factors; such as not smoking, maintaining an active lifestyle and a healthy weight, are also important to help manage the health of your heart. The most effective cholesterol lowering dietary strategies are replacing saturated and trans fats with unsaturated fats, and daily intake of plant sterols, as part of a healthy diet [9, 10]. These two strategies account for the majority of the cholesterol lowering effect that is achievable through diet. A daily intake of 2 grams of plant sterols from plant sterol enriched foods, as part of a healthy diet and lifestyle, has proven to lower LDL “bad” cholesterol by up to 9% . Replacing saturated and trans fats with unsaturated fats has the potential to further lower LDL cholesterol by around 6-8% . The effects of plant sterols from enriched foods are additive to those of a healthy diet. So in combination, plant sterols and choosing healthy fats in place of saturated fat have the potential to lower LDL cholesterol by about 15% [11, 12]. With even further benefits to cholesterol lowering by adopting healthy plant-based foods. Sanitarium promotes a diet rich in whole plant-based foods for optimising your health. As the processes that underlie your heart’s health, such as the narrowing of the blood vessels, can start much earlier in life than people may think, it’s important to look after your heart health from an early age by achieving and maintaining the desirable cholesterol levels. And it’s a similar story for other lifestyle factors for heart health like high blood pressure, smoking, overweight, a sedentary lifestyle and poor diet—the earlier you take action the better the long term outcomes. Regular cholesterol checks should therefore be part of our health routine. Take a positive step and discuss with your General Practitioner today. For more specific dietary advice on cholesterol management, speak to a registered dietitian. The New Zealand Nutrition Foundation suggests that people with elevated LDL cholesterol eat 2–3 grams of plant sterols each day from plant sterol enriched foods, as a part of a healthy diet and active lifestyle. For more diet and lifestyle information on how to help manage your heart health visit the Heart Foundation website or contact the Heart Foundation Helpline on 0800 863 375 for free information and support from qualified health professionals. Lowering cholesterol is recognised by leading health authorities as an important contributor to heart health and include plant sterols in their dietary recommendations for cholesterol management. Evidence-based dietary recommendations for the management of cholesterol and support of heart health have been developed by several international authorities and many of these now include plant sterol dietary recommendations. They include the National Heart Foundation of Australia, European Society of Cardiology, American Heart Association, International Atherosclerosis Society, Dutch Heart Foundation, Finnish Nutrition Association, Finnish Medical Society, Spanish Atherosclerosis Society and Nutrition Foundation of Italy [13-15]. The cholesterol lowering benefits of plant sterols are additive to statins therapy, so the Australian Heart Foundation also recommends that people taking statins can benefit from eating plant sterol enriched foods in addition to statin therapy [16-17]. People are encouraged to have their cholesterol tested by their General Practitioner, to take a positive step in helping manage your heart health. For more specific dietary advice on cholesterol management, speak to a registered dietitian. Weet-Bix™ Cholesterol Lowering key benefit claims—It’s effective, it’s easy and it’s enjoyable! It’s Effective: Weet-Bix™ Cholesterol Lowering is effective—the 2 grams of plant sterols in a daily serve of Weet-Bix™ Cholesterol Lowering is clinically proven to actively lower LDL cholesterol levels by up to 9% in 4 weeks as part of a healthy diet low in saturated fat. Research shows, based on 40 clinical studies published in peer reviewed journals, that consuming 2 grams of plant sterols daily lowers LDL cholesterol by up to 9% . 2 grams of plant sterols in Weet-Bix™ Cholesterol Lowering, consumed daily has been clinically verified, is aligned to the total body of evidence and lowered LDL cholesterol by up to 9% in 4 weeks . Dr. Peter Clifton is the Professor of Nutrition at the University of South Australia and a general physician. He has over 30 years' experience researching the prevention and treatment of cardiovascular conditions, type 2 diabetes, obesity and other metabolic conditions. Over the course of my career we have learnt a lot about heart health and the important role that diet and lifestyle plays. I recently conducted a clinical trial in partnership with Sanitarium Health and Wellbeing™ and their new breakfast cereal product Weet-Bix™ Cholesterol Lowering. The randomised clinical study on Weet-Bix™ Cholesterol Lowering, conducted by the University of South Australia with lead researcher Professor Peter Clifton, concluded that 2 grams of plant sterols from 2 Weet-Bix™ (one serve) per day significantly lowers LDL cholesterol. The LDL cholesterol lowering efficacy reported in the Weet-Bix™ Cholesterol Lowering clinical study was aligned with (not significantly different from) the LDL cholesterol lowering efficacy of the most up-to-date analysis of all available clinical studies of products using a similar dose of plant sterols [delivering 2-2.5g/d (average 2.1g/d) of plant sterols] . View the peer-reviewed clinical trial in the Journal of Foods - "Cholesterol-Lowering Effects of Plant Sterols in One Serve of Wholegrain Wheat Breakfast Cereal Biscuits—a Randomised Crossover Clinical Trial". View our recent article in New Zealand Doctor. It’s Easy: Weet-Bix™ Cholesterol Lowering is easy—eating just two Weet-Bix™ Cholesterol Lowering daily, provides the optimal amount of 2 grams of plant sterols in one serve. Compliance with 2 Weet-Bix™ per day was excellent among participants of the Weet-Bix™ Cholesterol Lowering clinical study. This supports 2 Weet-Bix™ Cholesterol Lowering daily as being an easy dietary change to implement and comply with. And we've made it even easier with these delicious serving suggestions. It’s Enjoyable: Weet-Bix™ Cholesterol Lowering is enjoyable with the same great taste as the regular Weet-Bix™ New Zealanders know and love. In the Weet-Bix™ Cholesterol Lowering clinical study, simply eating 2 Weet-Bix™ (one serve) per day was found to improve measures of diet quality including wholegrain (increased by 33%), thiamin (37%), riboflavin (28%), niacin (13%) and iron (27%). Fibre, fat, protein, carbohydrate and energy did not change. Close to half (47%) of the participants could not identify the product containing plant sterol. For the nutritional information and frequently asked questions on Weet-Bix™ Cholesterol Lowering visit the product page. For more information on the role of wholegrains in overall health and their specific role in heart health visit Grains & Legumes Nutrition Council. Sanitarium’s new Weet-Bix™ Cholesterol Lowering breakfast cereal, demonstrates the Company’s commitment to investing in innovative food solutions to help New Zealanders to experience better health. In another first, Sanitarium achieved an update to the Food Standards Code for Australia & New Zealand (FSANZ) which now allows up to 2 grams of plant sterols to be included in a serve of breakfast cereal. Sanitarium’s Weet-Bix™ Cholesterol Lowering is New Zealand’s first breakfast cereal proven to significantly lower cholesterol in a single serve. Weet-Bix™ Cholesterol Lowering will be the only breakfast cereal and food on the market to contain 2 grams of plant sterols in a serve with exclusive permission in the Food Standards Code for Australia and New Zealand for up to 1 year. After an extensive review and public consultation, FSANZ confirmed the safety of plant sterols and recognised the potential public health benefit of offering consumers an easy and effective way to reduce cholesterol via 2 grams plant sterols per serving of breakfast cereal. This has given us the ability to deliver an effective dose of plant sterols per serve and create Weet-Bix™ Cholesterol Lowering. 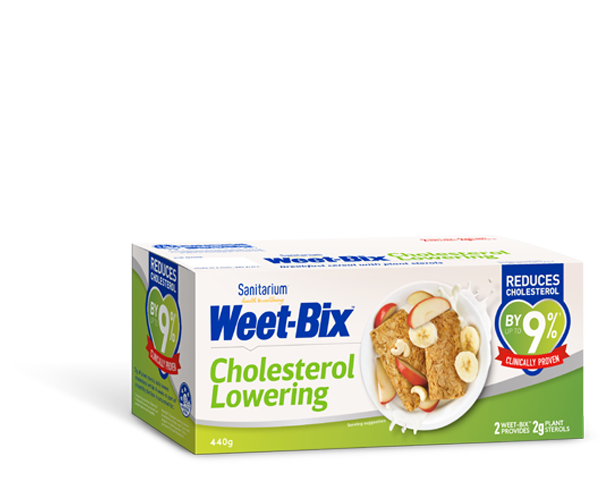 †Two Weet-Bix™ Cholesterol Lowering daily provides 2g of plant sterols, which are clinically proven to lower LDL cholesterol by up to 9% in 4 weeks as part of a healthy diet low in saturated fat. Weet-Bix™ Cholesterol Lowering may not be suitable for children under 5 years and pregnant and lactating women. Ministry of Health, NZ Health Survey: Annual update of key results 2014-2015. 2015, Wellington: Ministry of Health. Ministry of Health, Annual Update of Key Results 2015/16: New Zealand Health Survey, Ministry of Health, Editor. 2016: Welllington. Ministry of Health, Unpublished data email correspondence with: Ministry of Health 16 Jan 2017, Editor. 2016: Wellington. Huxley, R., S. Lewington, and R. Clarke, Cholesterol, coronary heart disease and stroke: a review of published evidence from observational studies and randomized controlled trials. Semin Vasc Med, 2002. 2(3): p. 315-23.7. Catapano, A.L., et al., 2016 ESC/EAS Guidelines for the Management of Dyslipidaemias. European Heart Journal, 2016. 37: p. 2999-3058. Cholesterol Treatment Trialists, C., et al., Efficacy and safety of LDL-lowering therapy among men and women: meta-analysis of individual data from 174,000 participants in 27 randomised trials. Lancet, 2015. 385(9976): p. 1397-405. Cholesterol Treatment Trialists, C., et al., The effects of lowering LDL cholesterol with statin therapy in people at low risk of vascular disease: meta-analysis of individual data from 27 randomised trials. Lancet, 2012. 380(9841): p. 581-90. National Vascular Disease Prevention Alliance. Guidelines for the management of absolute cardiovascular disease risk. 2012 [cited 2017 10 May]; Available from: https://www.heartfoundation.org.au/images/uploads/publications/Absolute-CVD-Risk-Full-Guidelines.pdf. Clifton, P., et al., Dietary intervention to lower serum cholesterol. Aust Fam Physician, 2009. 38(6): p. 424-9. Clifton, P., Lowering cholesterol - a review on the role of plant sterols. Aust Fam Physician, 2009. 38(4): p. 218-21. European Food Safety Authority, Consumption of Food and Beverages with Added Plant Sterols in the European Union. The EFSA Journal, 2008. 133: p. 1-21. British Heart Foundation. Plant sterols and stanols. 2014 [cited 2017 22 June]; Available from: https://www.bhf.org.uk/publications/heart-conditions/medical-information-sheets/plant-sterols-and-stanols. HEART UK. Plant sterols and stanols (phytosterols). [cited 2017 22 June]; Available from: https://heartuk.org.uk/cholesterol-and-diet/healthy-eating/plant-sterols-and-stanols. Heart Foundation. Position Statement: Phytosterol/stanol enriched foods. 2007 [cited 2017 10 May]; Available from: https://www.heartfoundation.org.au/images/uploads/publications/Stanols-QA.pdf. Han, S., et al., Effects of plant stanol or sterol-enriched diets on lipid profiles in patients treated with statins: systematic review and meta-analysis. Sci Rep, 2016. 6: p. 31337.